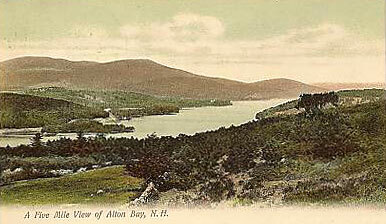 Another photo of Alton Bay from the Alton Bay bridge. 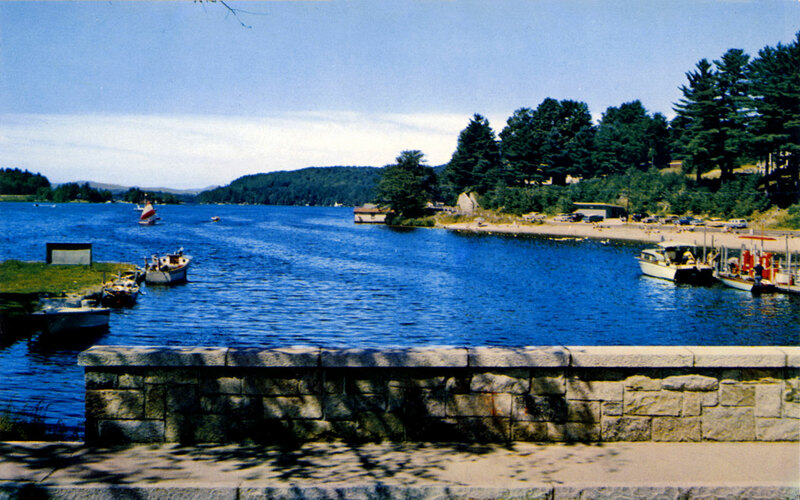 The other half of the bridge, not visible in the above pictures, sported an antique lamppost. 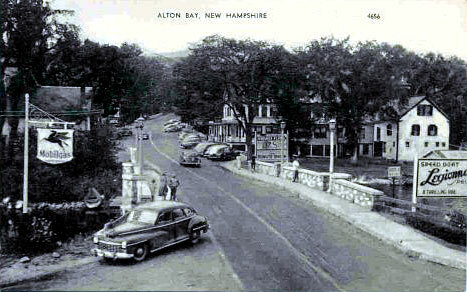 A 1940's view of the bridge roadway. 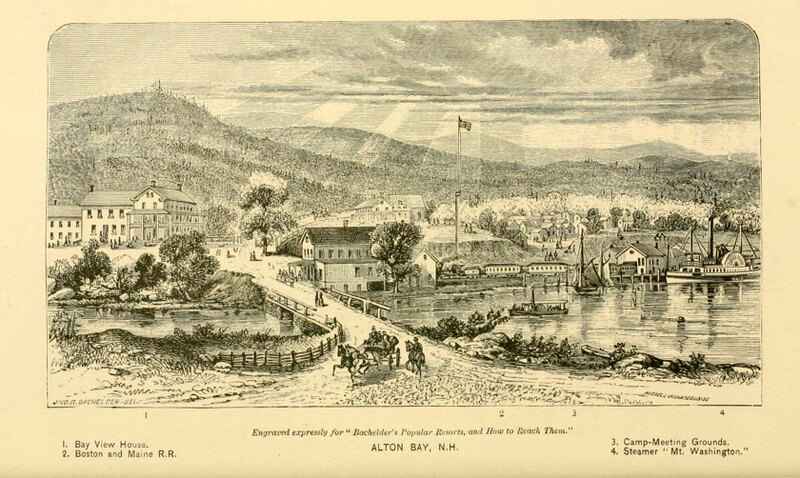 An engraving of Alton Bay in 1874, drawn from nearly the same perspective as the above postcard. 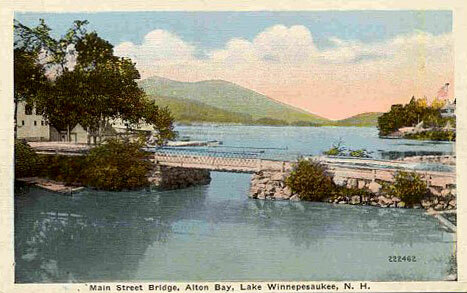 From Bachelder's "Popular Resorts and How to Reach Them"
Another 1940's view of the bridge roadway. 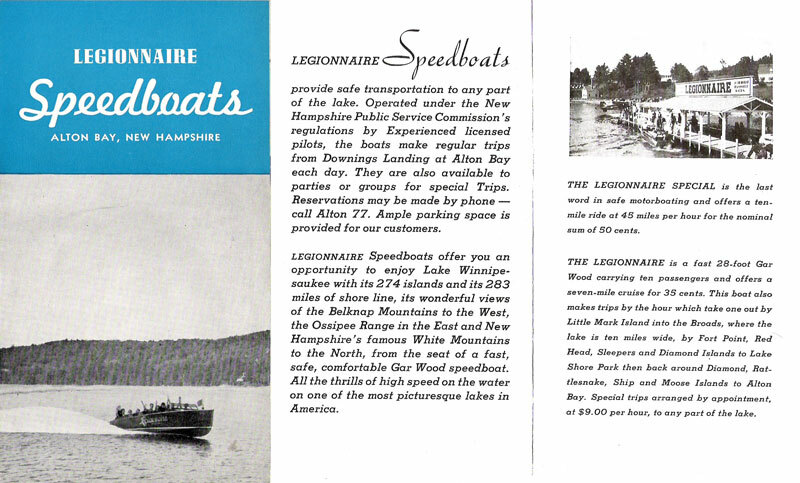 Notice the sign for the Legionnaire speed boat. 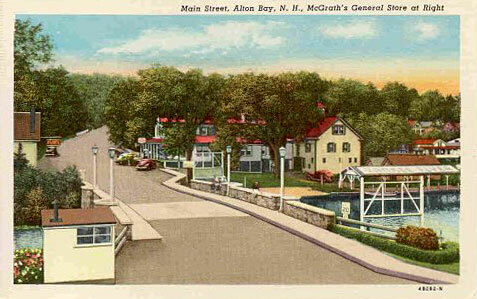 Another 1940's view, just past the bridge. 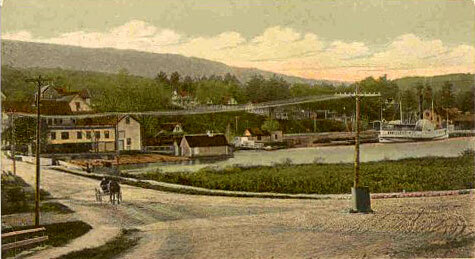 Two earlier views of the bridge roadway, before the current bridge was built. 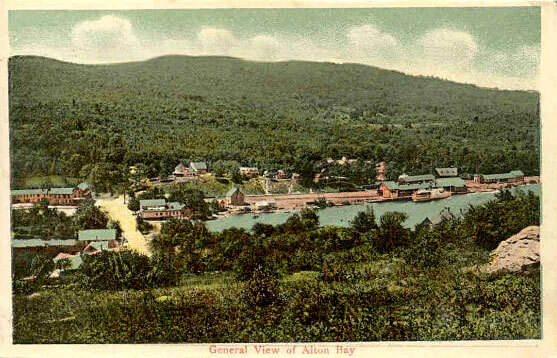 Below: Visible at the center of the photo is the two-story, Bay View Pavilion. 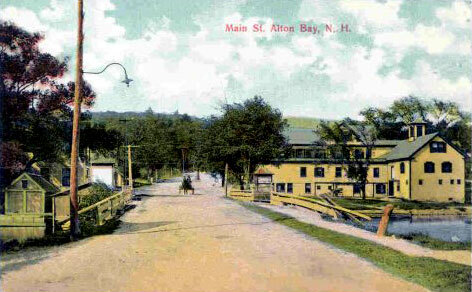 Built in 1921 by Stephen Lynch, the building housed a restaurant and movie theatre, but it was best known for its dance hall. 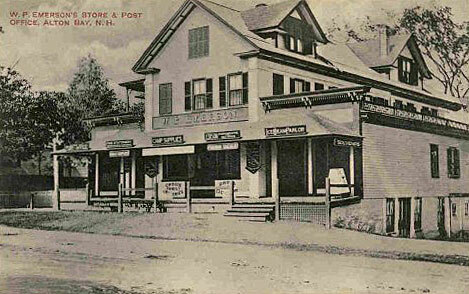 The building burned in 1928 and was replaced by a more modest one-story building in 1929. 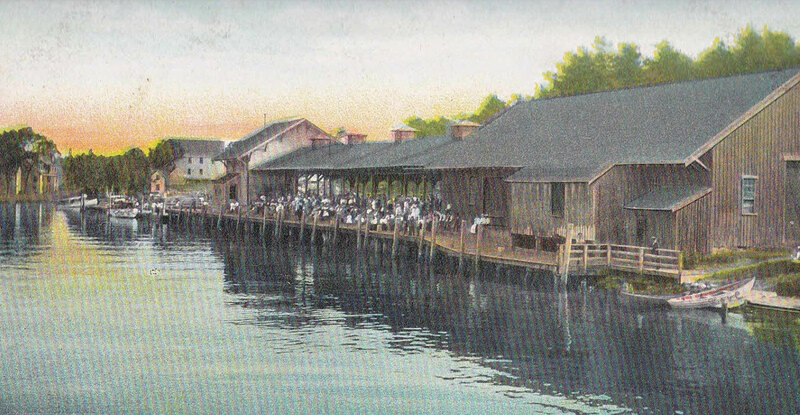 The new building continued to offer dancing and other entertainment. 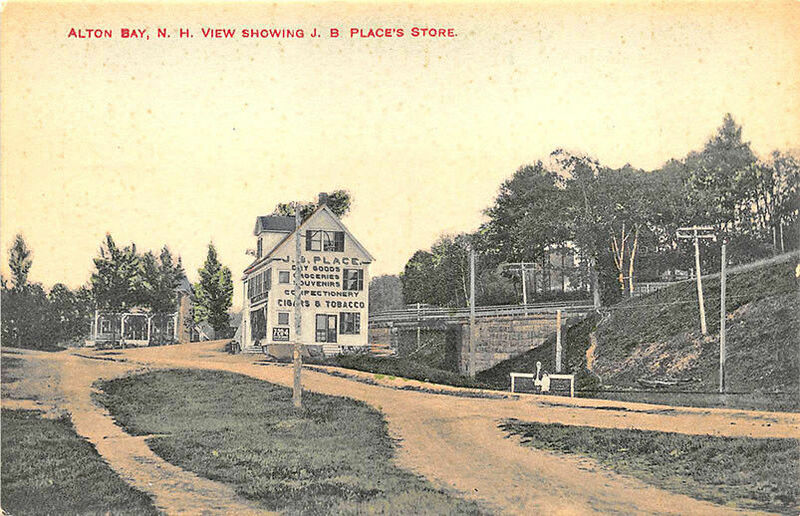 Here's what the old bridge looked like. 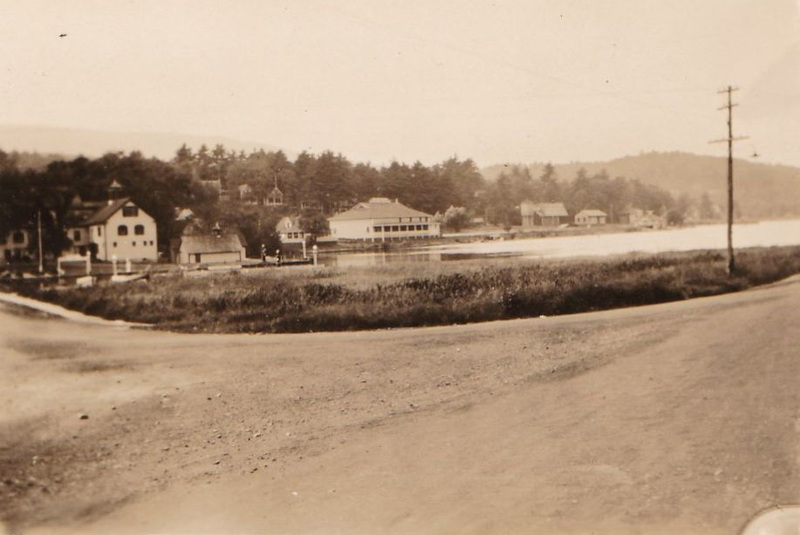 Another early view of the bridge roadway. 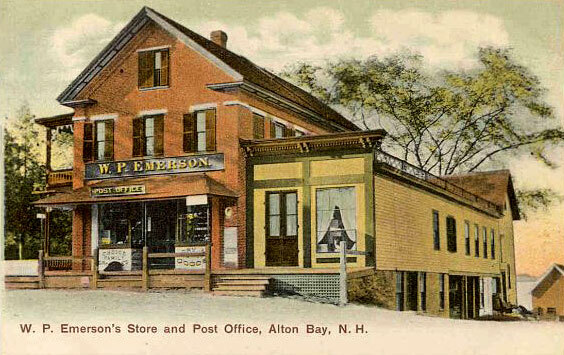 On the right is Emerson's store. 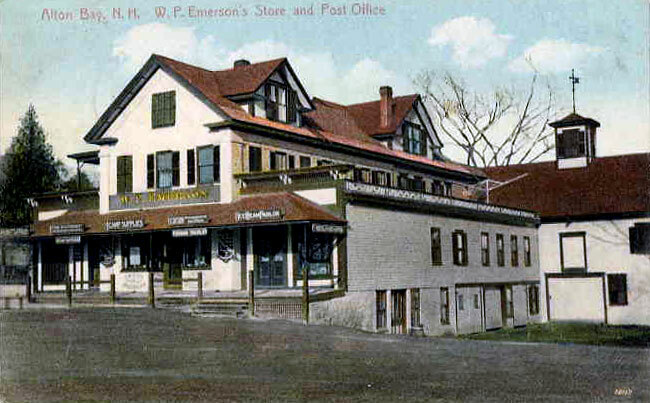 Emerson's store was a very popular postcard subject. 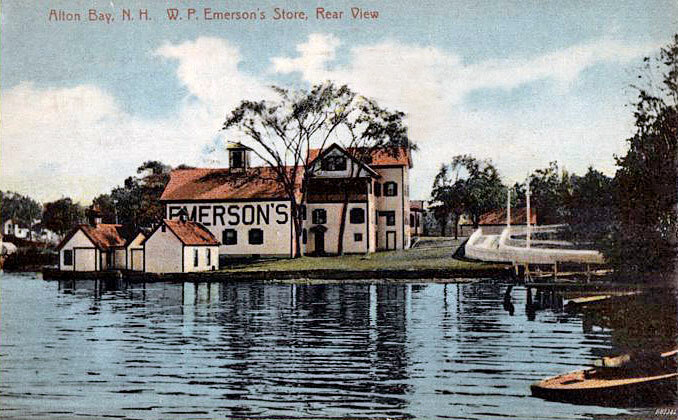 A brochure published by Mr. Emerson shows his store in the distance in the third photo on the bottom right of the cover. 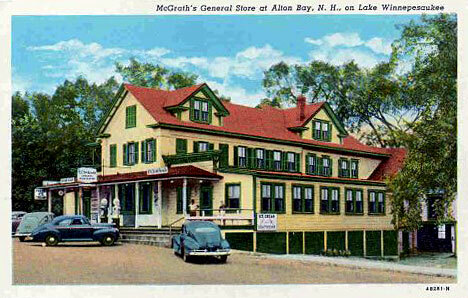 Apparently a Mr. McGrath bought out Mr. Emerson by the 1940's. 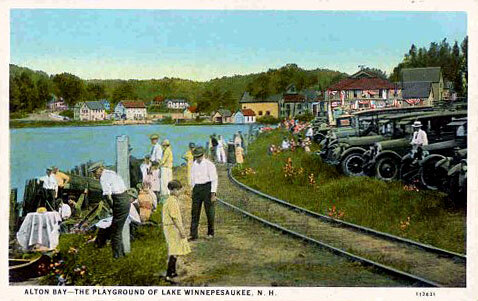 The car on the right is removed in the second version of the same postcard. 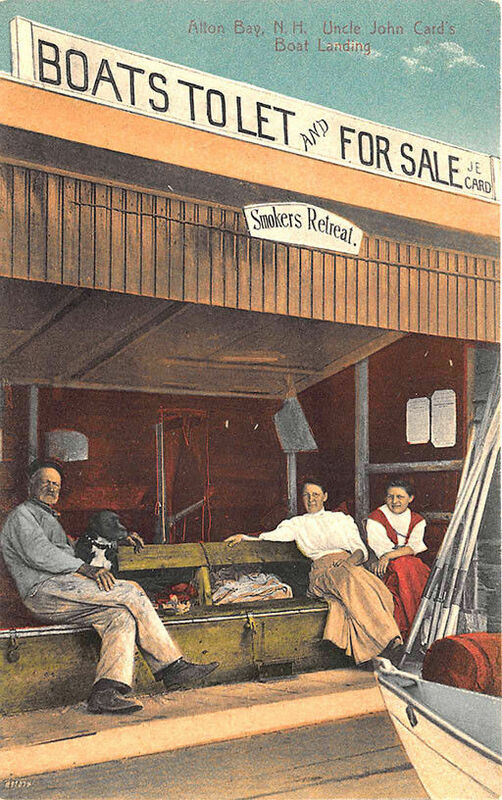 Here are several stores that preceded McGraths. 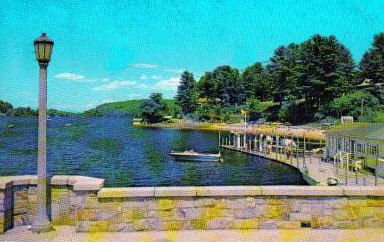 Looking towards the bridge from the other direction. way off in the distance...the ducks add a nice touch. 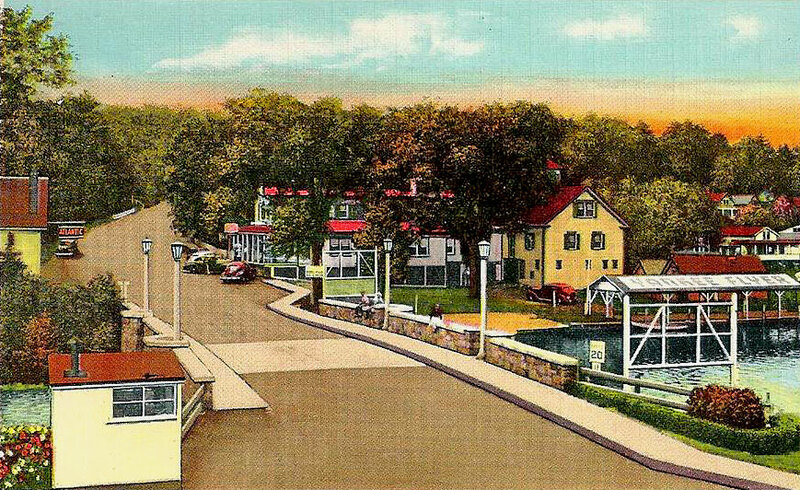 Legionnaire sign is on the right. 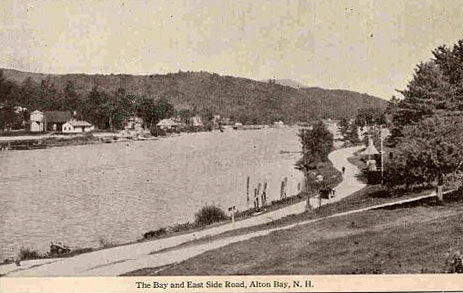 In this second photo, notice the seaplane heading toward the beach. 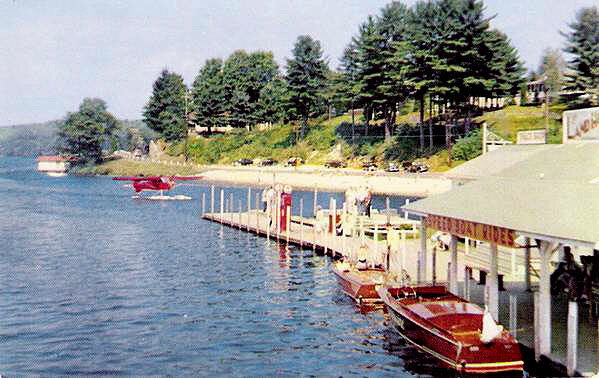 In 1947, seaplane rides were offered by Skinner Seaplane Service. 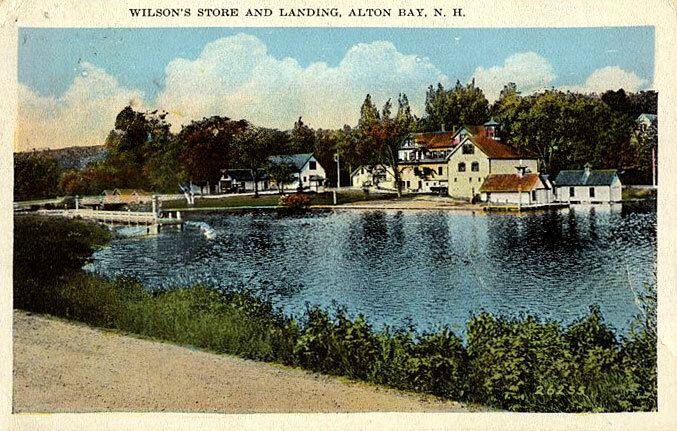 Even today, there is still a seaplane base in Alton Bay. 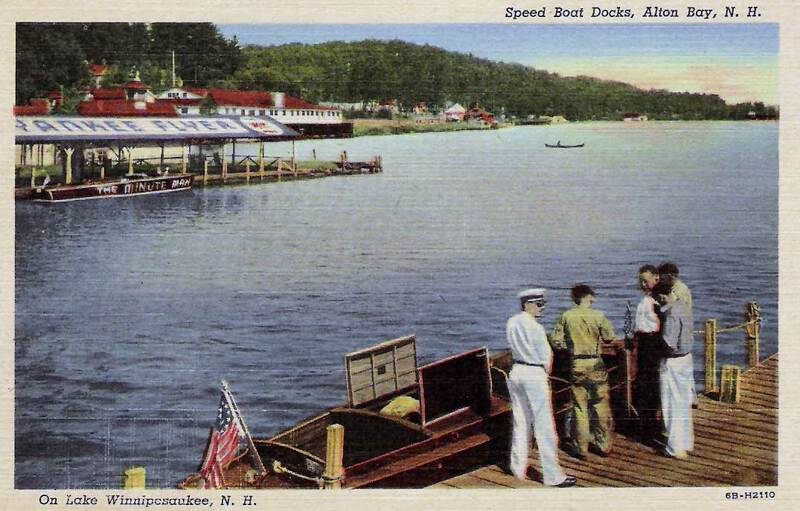 In this third postcard, once again we see a seaplane arriving. 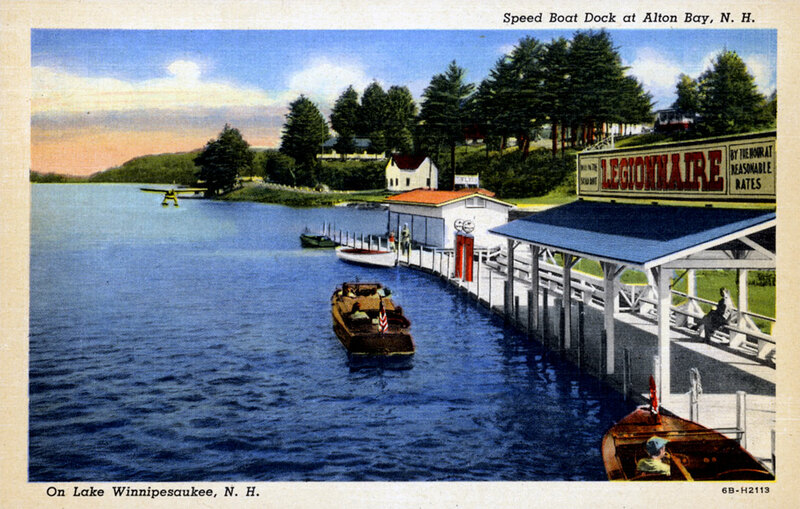 The sign says : "Ride in the speed boat Legionnaire by the hour at reasonable rates"
There were actually 3 different Legionnaire speedboats offering 3 different rides. 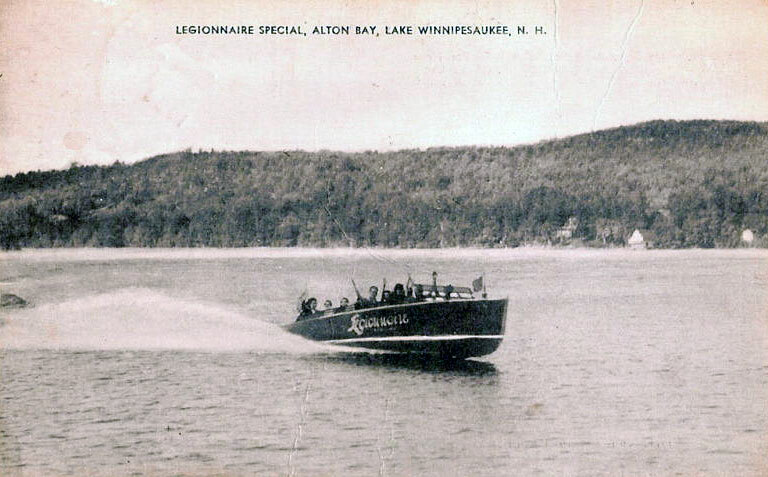 The cheapest was a 35 cent, 7-mile ride in the regular Legionnaire, a 28', 150hp Gar Wood..
Fifty cents would get you a 10-mile ride at 45mph in the Legionnaire Special, a 26', 225hp Chris-Craft. 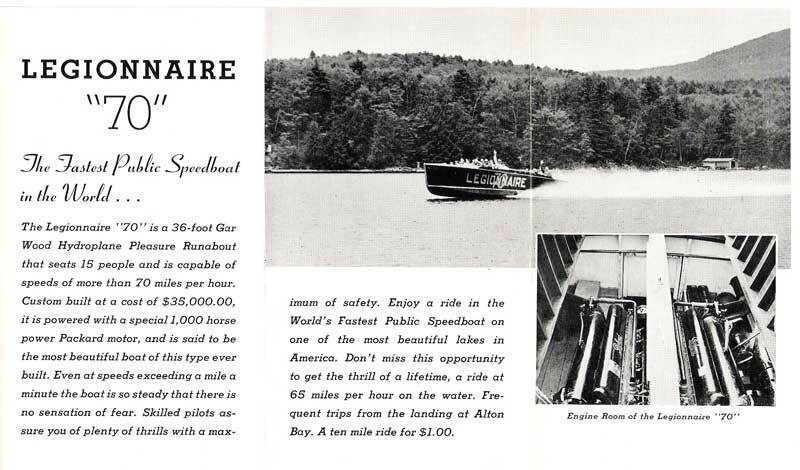 And a buck would get you the 10-mile ride at 65mph in the Legionnaire 70, a 36', 1000hp Gar Wood. 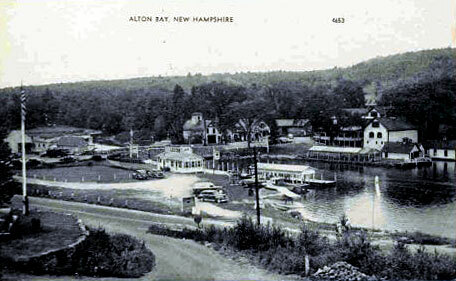 The full photo from the cover of the above brochure. 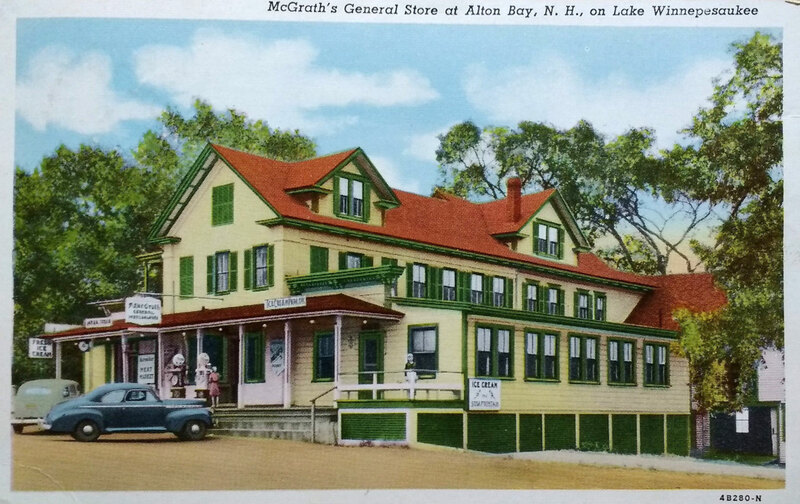 Both the cover and center photos of the brochure were made into postcards. 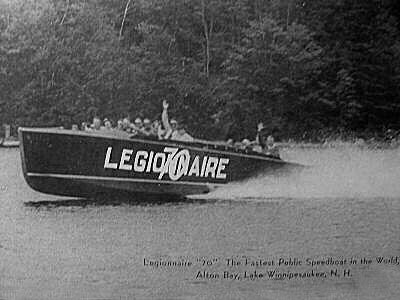 A close-up of the regular Legionnaire ride. 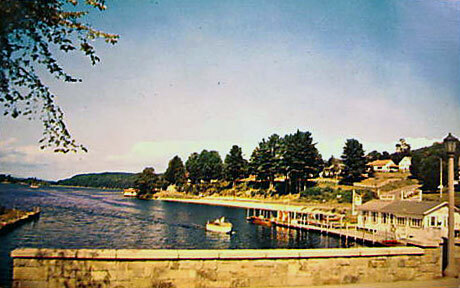 Speedboat with the Alton Bay Bandstand (in the middle of Alton Bay!) in the background. 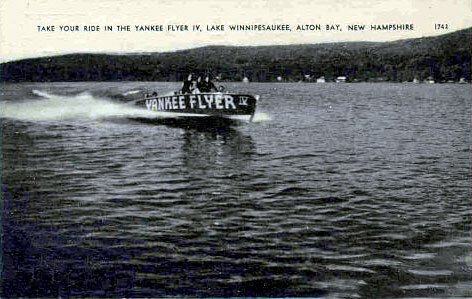 An ad from the 1939 Lakes Region Association's "Where To" guidebook. 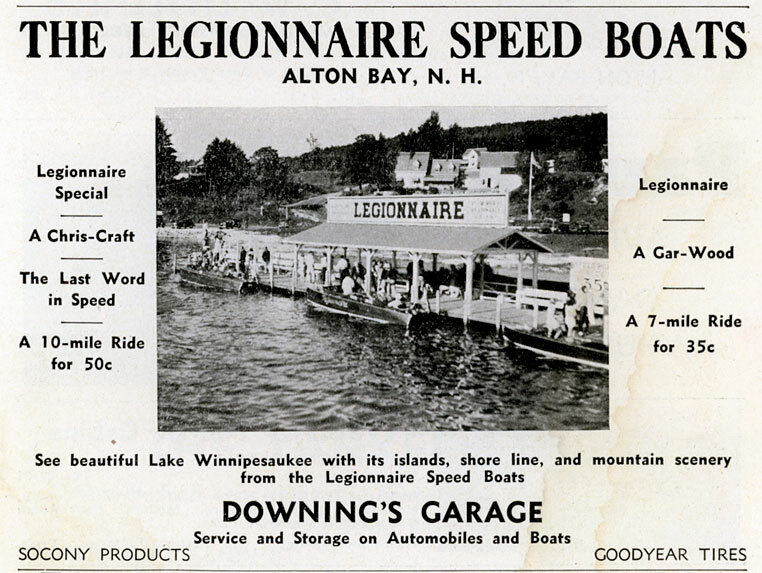 Downing's Legionnaires had competition. 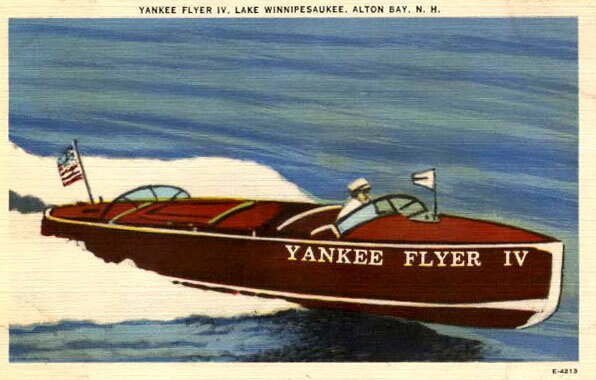 Right across the way one could ride Cram's Yankee Flyer or the Minute Man ( a 26', 275hp Hackercraft). 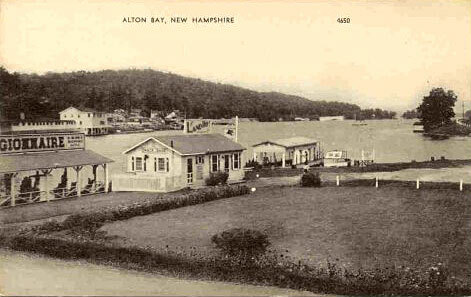 Same photo, different caption, and some photo retouching; Cram's has become the Yankee Flyer Pier; the Minute Man has become "Miss Alton Bay"; the Yankee Flyer has dropped the "IV"
A view of Cram's from Downing's. 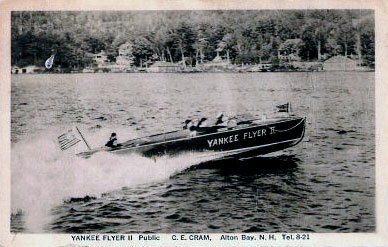 Over the years there were four Roman numeral versions of the Yankee Flyer. Version I was a 30', 350hp Dodge. 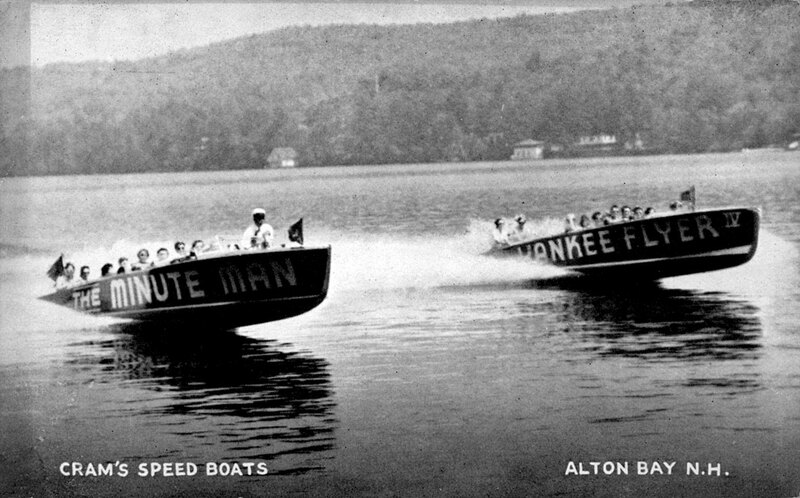 Version II was a 28', 275hp Dodge. We have no information regarding Version III. Version IV was also a 28' Dodge. 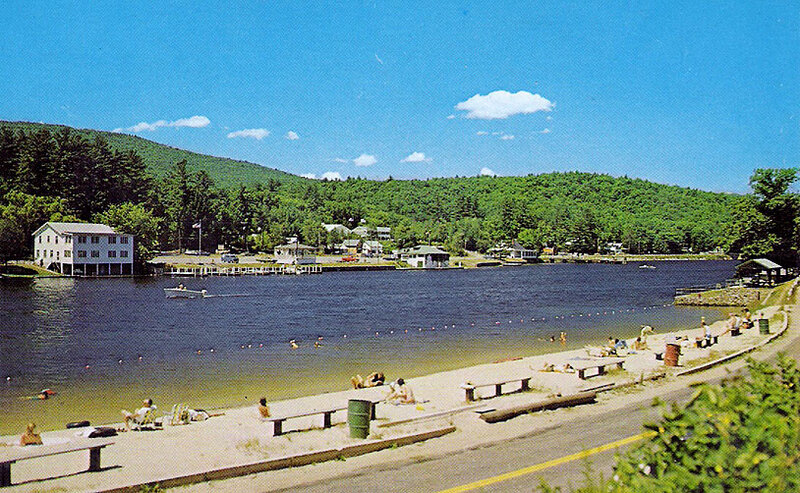 Also on Weirs Times cover page, Thursday, July 29, 2004. 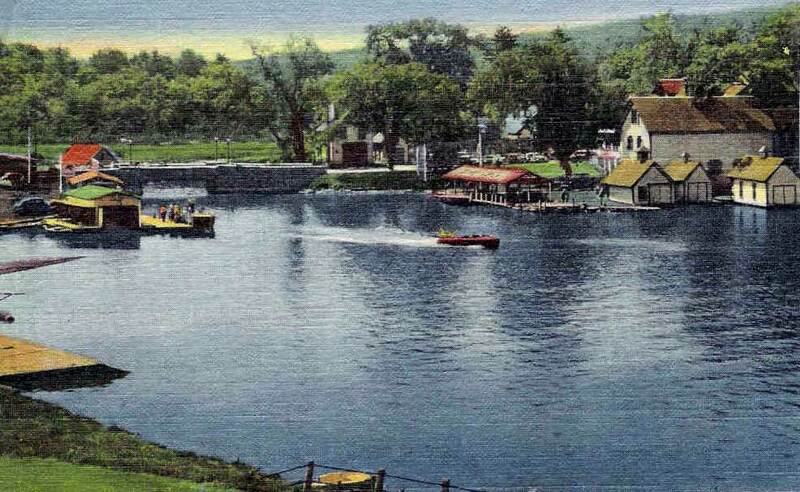 "These ride boats had already seen many years of service by 1948, the year pictured here, but they still drew flocks of eager passengers in the upbeat years following World War II. 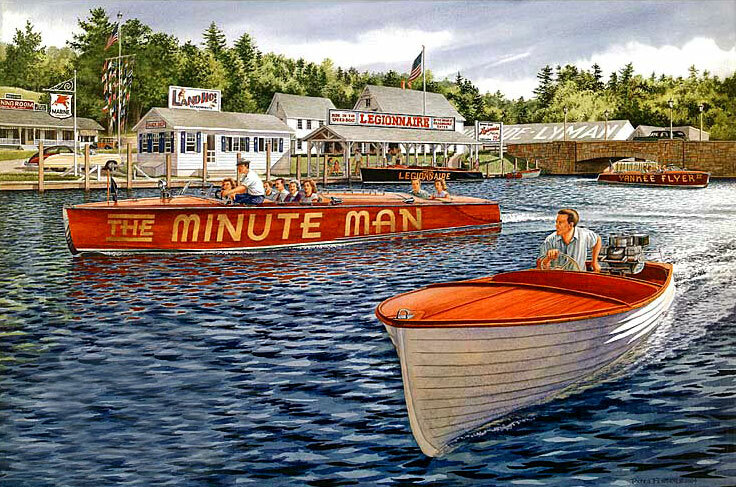 "The Minute Man" was a 28 foot Hacker Craft from the late 20's or early 30's, named for its mile-a-minute speed. 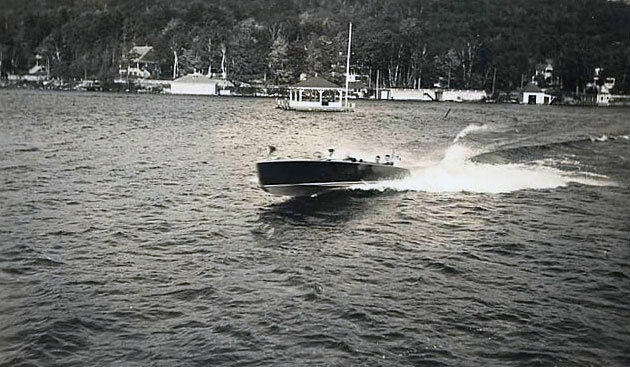 As it moves out, a fellow optimistically looks for a challenge match in his new 15 foot Lyman powered by some serious "iron", a 1948 33.4 horsepower Evinrude Speedifour. 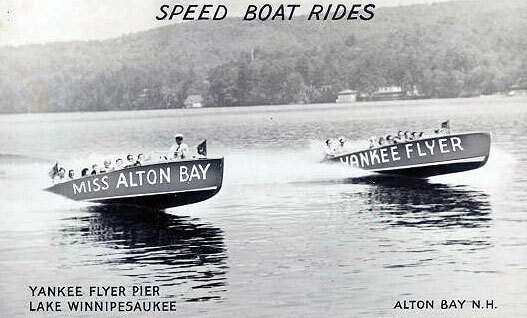 Returning from a "thrilling" run up Alton Bay is the "Yankee Flyer IV", a 28 foot Dodge triple cockpit runabout. Across the channel awaits the "Legionnaire 70". 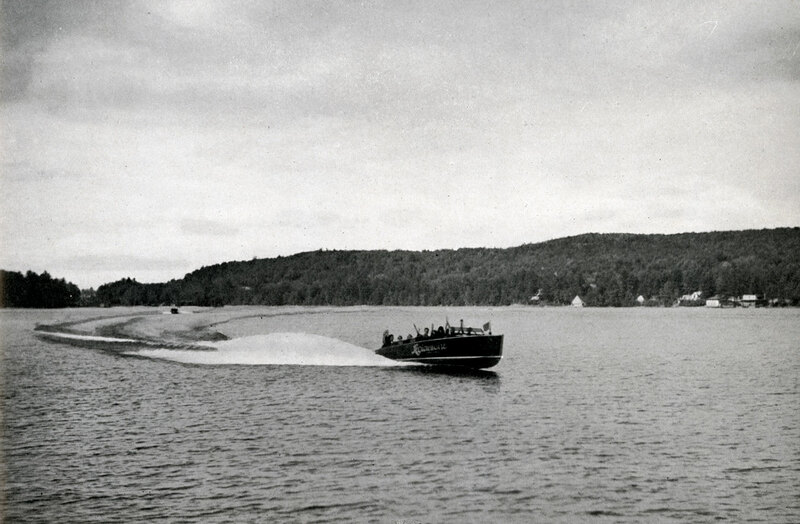 Billed as "the fastest public speedboat in the world", this custom-built 36 foot Gar Wood, powered by a 1,000 horsepower Packard engine, burned airplane fuel and reached speeds in excess of 70 mph. 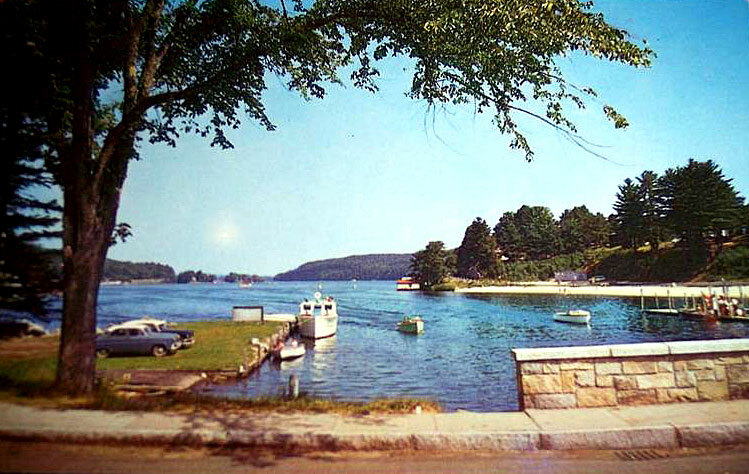 Downing's Landing anchored the tip of Alton Bay and was ready to provide you with everything from breakfast or lunch in the "Land-Ho" snack shop, to boat rides, gasoline, a new boat or motor, but always a happy memory." 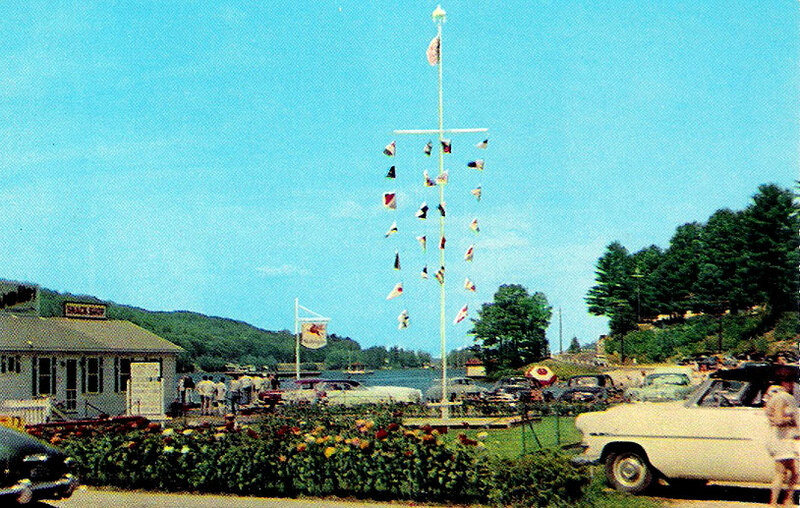 Below we see the Legionnaire docks on the left, and the Yankee Flyer docks on the right. 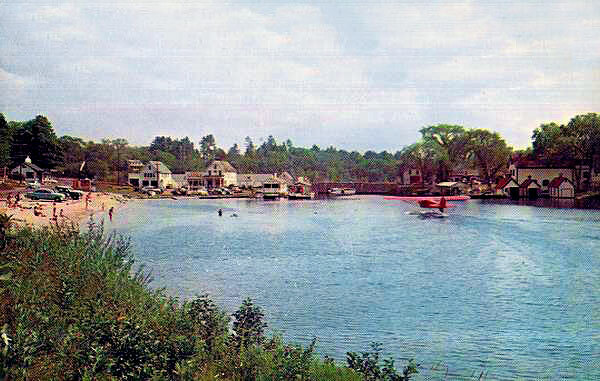 To the extreme left we see a wee bit of the seaplane base. 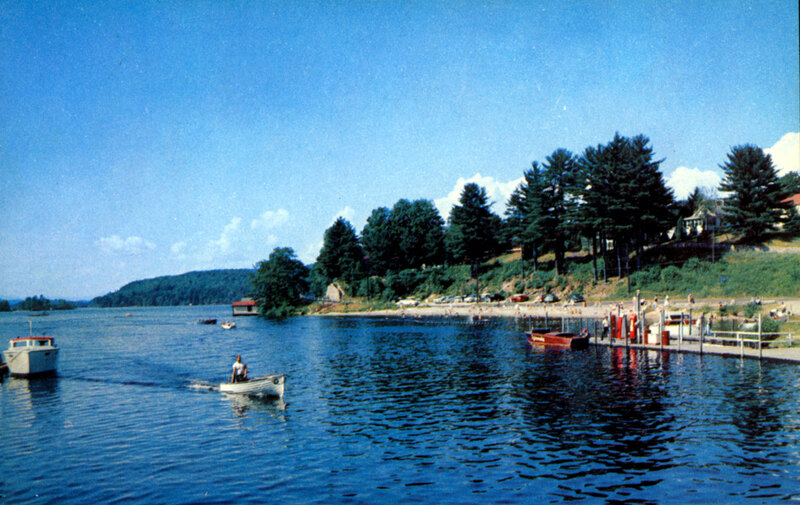 A 1950's version of the same view, showing the public beach, and the seaplane at its base. 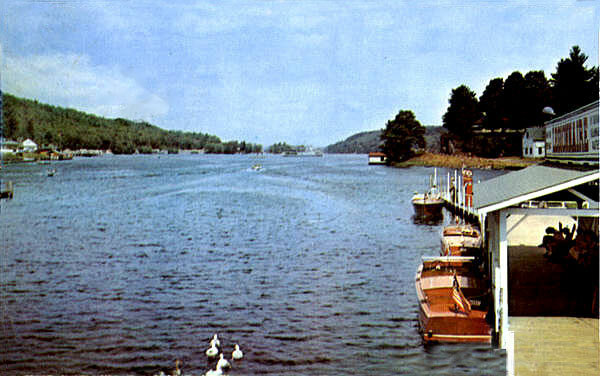 An early 50's view of the bay showing the seaplane heading to its base. 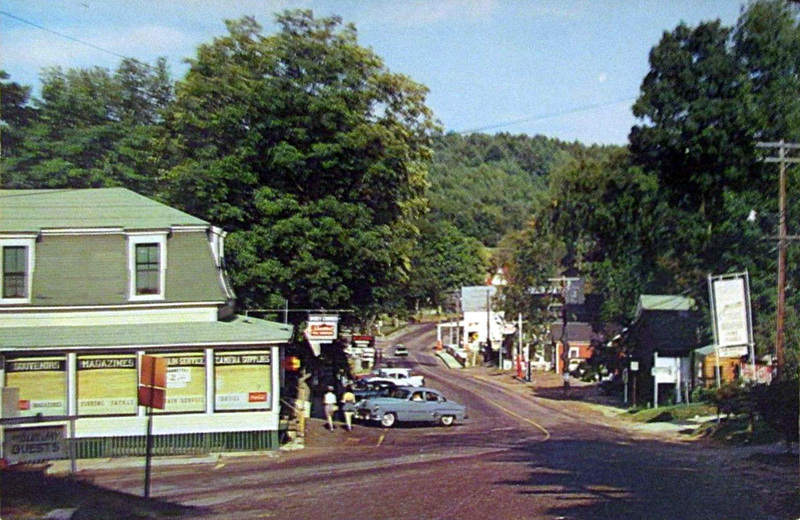 Here's the same view, about 50 years earlier! 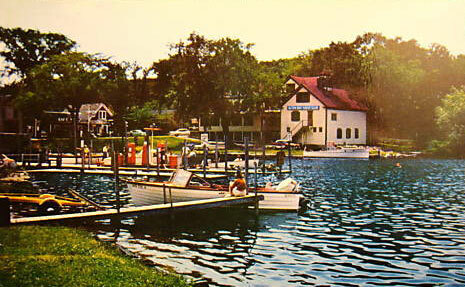 Here is another 1950's postcard, showing a land-based view of the Legionnaire docks. 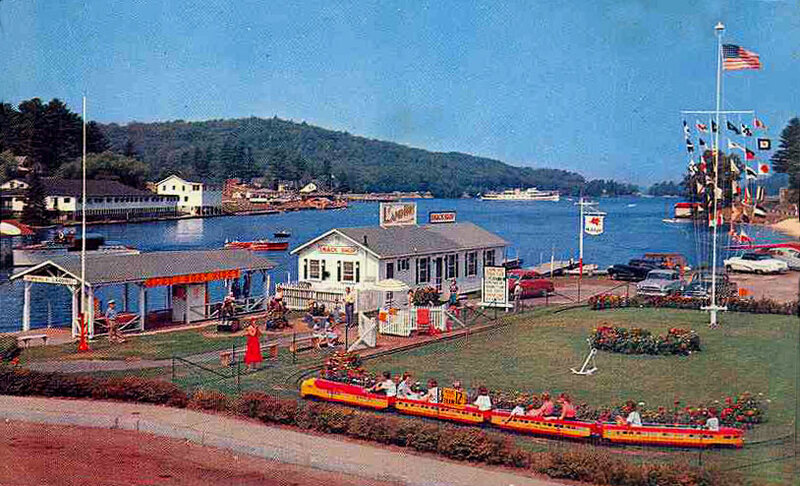 The location, Land-Ho, offered a kiddie ride as well as speedboat rides! 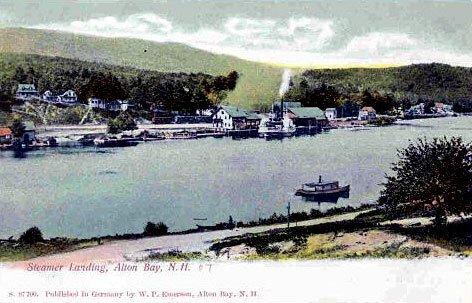 Note the Mount Washington leaving Alton Bay in the distance. 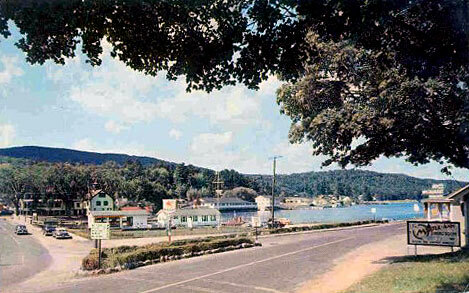 Another 50's view of Land-Ho. 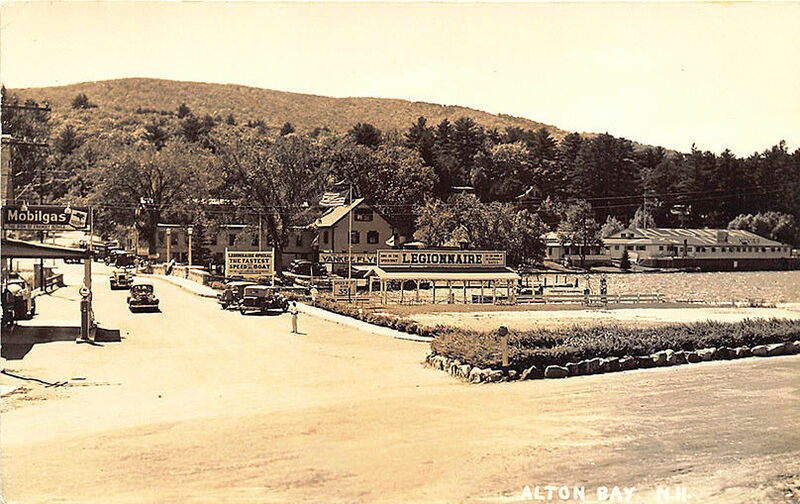 A 1940's view of Land-Ho. 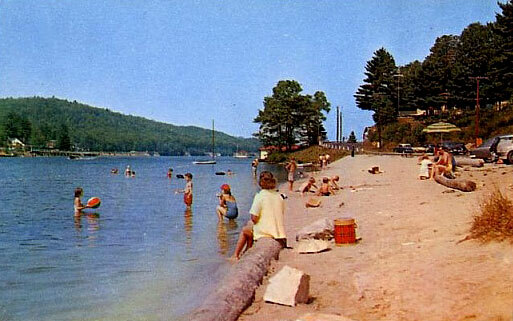 Another 1940's view of Land-Ho. 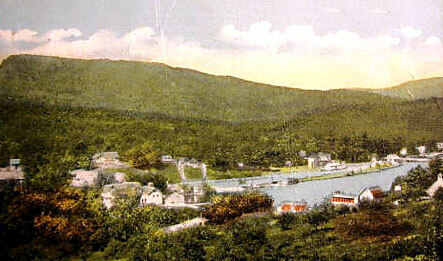 Note the seaplane at its base. 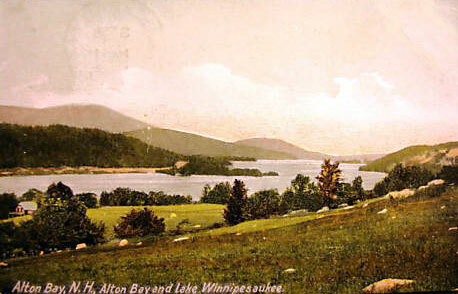 A similar view as the above card, but about 20-30 years earlier! Note the caption. 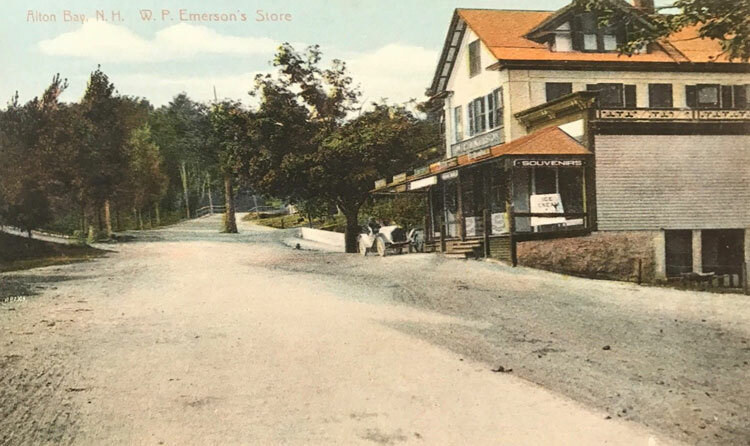 Emerson's Store (see above) apparently passed to a Mr. Wilson before it passed to Mr. McGrath. 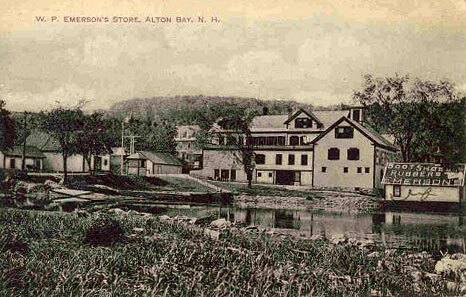 Here's the same view again, but much earlier! 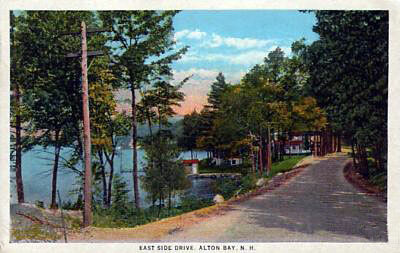 This 1950's postcard shows a closeup of the public beach on the east side of Alton Bay. 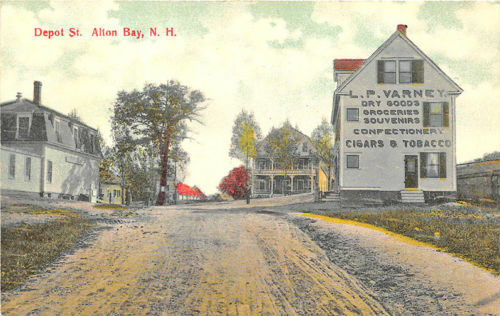 An early view of this same location shows no beach. 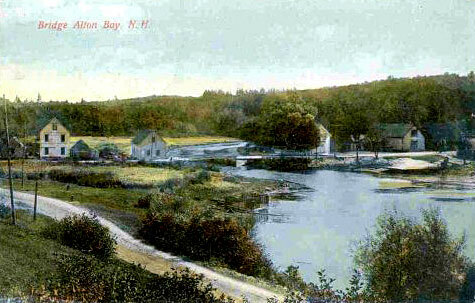 An even earlier view shows an overgrown shoreline. 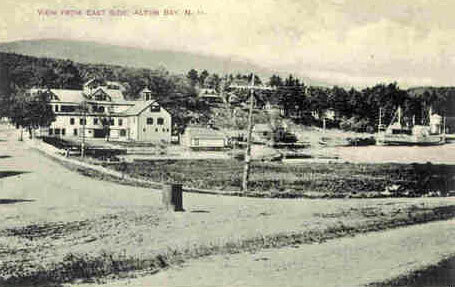 Probably the earliest view from the East side. Here's what lay just up beyond the bend in the road. Views from up on the hill on the east side. 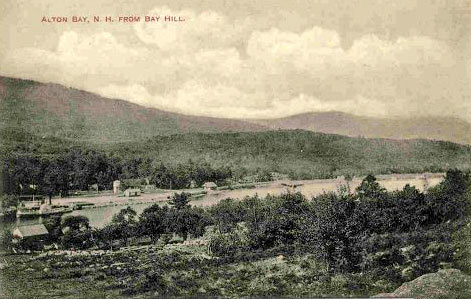 More views from the hill on the east side. 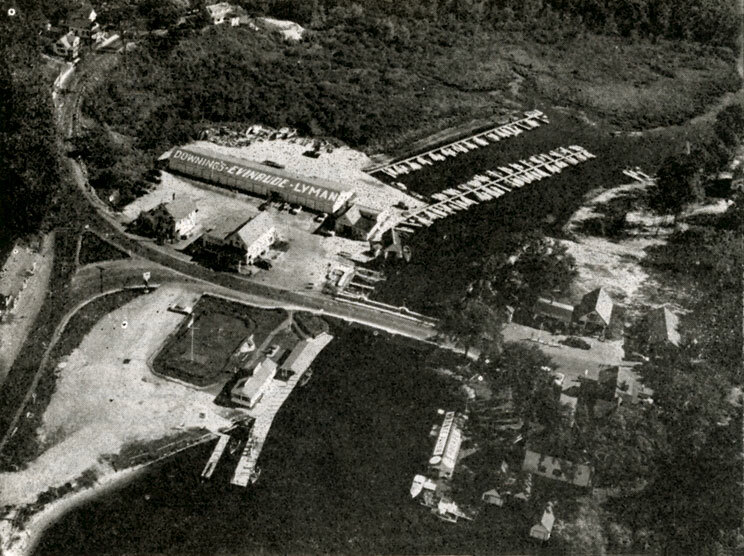 A close-up aerial view of Downing's, from an advertisment in the 1956 Lakes Region Association's "Where To" guidebook. 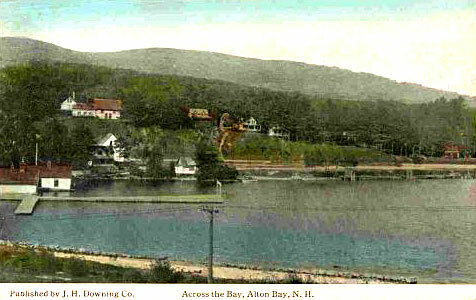 We couldn't resist throwing this old postcard in, showing the bay from the west side. 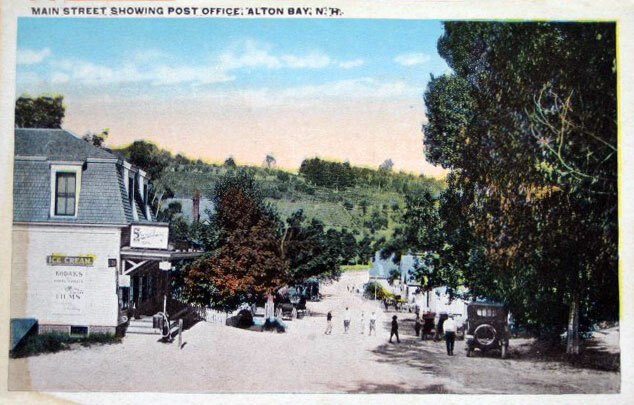 Similarly, we couldn't resist throwing in this postcard, postmarked in 1908, showing "Alton in the Future". 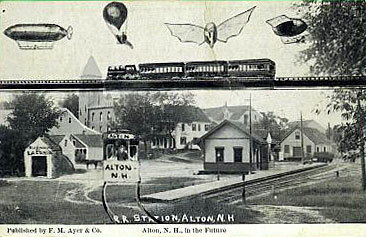 The future was conceived to offer overhead monorail transportation; and a variety of modes of transportation by air, including a zeppelin, a hot air balloon, a flapping wing aircraft, and a flying egg! But the artist seems to have lacked imagination regarding ground transportation. 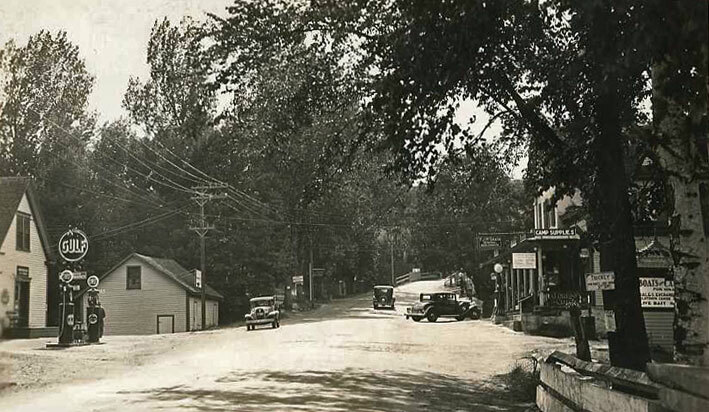 Where are all the cars? 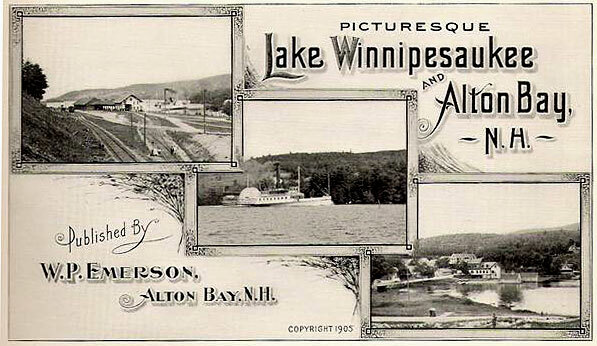 Apparently not needed, as one can travel by train or streetcar, or take a "Subway to Laconia"! 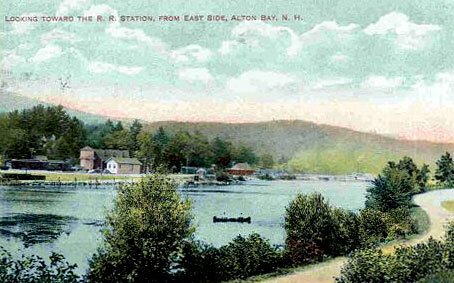 Another old postcard shows the original Alton Bay docks. 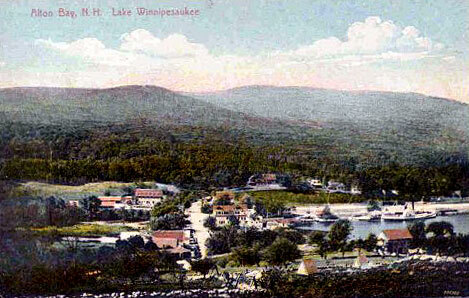 A crowd is awaiting the arrival of the Mount Washington steamship. 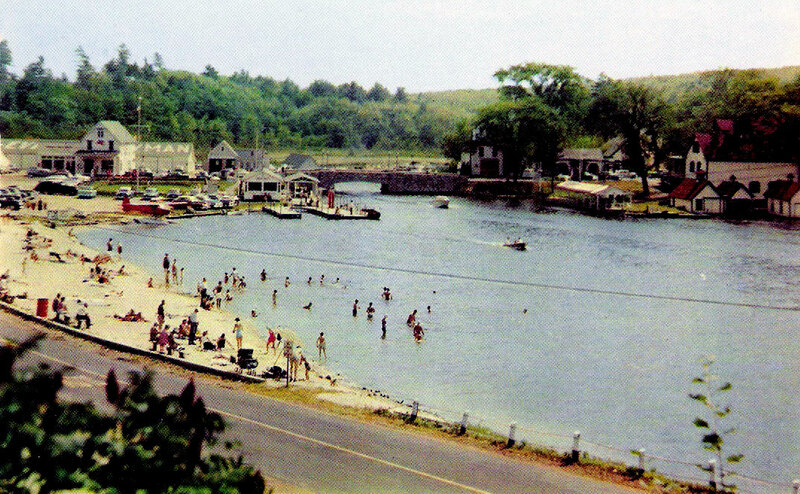 A boater approaches the Legionnaire docks in this 1950's chrome photo. 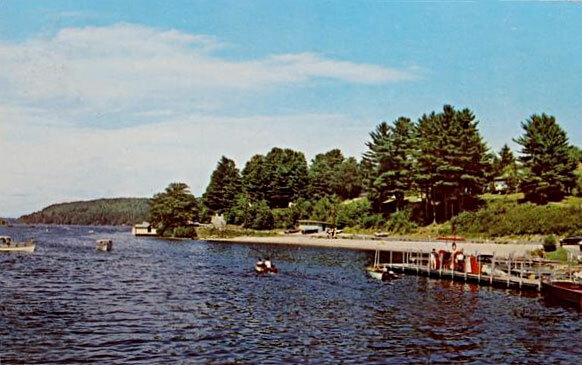 View approaching the bridge, from the opposite direction of most of the photos on this page, 1960's.